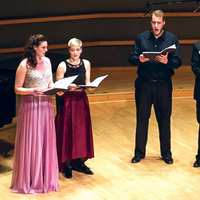 The Mondavi Center’s longstanding partnership with Curtis on Tour brings us an ensemble of four vocalists from the Curtis Opera Theatre in a program of operatic favorites—arias, duets and ensemble pieces—as well as gems from the Great American Songbook and Brahms’ Liebeslieder Waltzes. This tour celebrates the Curtis Opera Theatre’s legacy of educating and training many of the world’s most gifted singers. Curtis on Tour is the Nina von Maltzahn global touring initiative of the Curtis Institute of Music, and its alumni are engaged regularly at the world’s great opera houses and professional training programs. This is a FREE, ticketed event.